If you notice how good interior decorators work, they usually employ a piece in a certain room that would bring everything together. In a grand hall, for example, the focal point would be the chandelier that would hang above everyone. The intent of the decorator in this case was probably to make a statement that this place is grandiose and elegant, and while the fixtures and furniture would be enough to prove that point, a giant ornament hanging from the ceiling is just a classy touch to remind everyone of that fact. Unlike chandeliers that leave a great impression on people because of the fact that it is very visual and ostentatious, a round area rug is more of a background piece that is somehow hard to discern but is no nonetheless helpful with regard to setting the mood. You’d know right away that there was something different in a room if there was a round area rug present, although you might have difficulty in trying to point it out at first. When you notice it at last, though, you’d be surprised at how elegant and comfortable it is as an individual component of an entire room. You’d probably think that without everything else, a round area rug would be sufficient to make a room feel homelier than ever. You’d then realize that a round area rug is not a selfish home piece that wants all the attention to itself, rather, it compliments a set-up in such a way that it makes everything look better together. 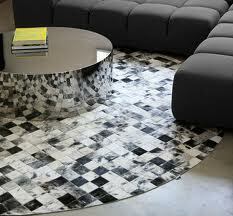 Round area rugs go great in rooms with lots of striking lines and geometric shapes. In a room, for example, which is shaped like a rectangle, with wooden furniture that are made of wooden planks and soft cushions, lamp fixtures at the sides of the room, and paintings in frames hanging from the wall, a round area rug would bring contrast and thereby bring the combination of the room’s individual components together. It’s like working with opposites, with the centerpiece being actually a background piece that sets the mood. 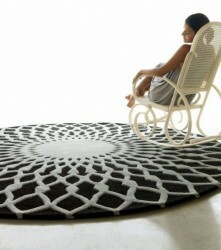 Round area rugs also work great in wide open spaces. Say you have an studio type apartment room which is composed of a vast expanse with only the comfort room as the only thing separate from everything else, round area rugs would be perfect accents to subliminally partition your living space into different parts. Just by putting a round area rug on your sleeping set up, you’d be able to distinguish up to where the boundary of the sleeping area extends to, as well as where your kitchen actually starts. You have to find out what you need to use a round area rug for before you decide to purchase and actually utilize it in your home. Imagine round area rug as you will a piece of rock – it can be used as a paper weight, as something to throw to someone you hate, or even as an ornament given the proper and corresponding decoration. A round area rug may turn out to be the saving grace of a poorly conceived room if used properly, or may otherwise plunge it to deeper depths. As a parting advice, try to use your own personal sense of style when trying to figure out what round area rug to use for your home. More than just wanting your living space to look good, it should embody how you are as a person and your set-up should be a way of expressing yourself. I’m not saying you should buy if you don’t like it, but since most of my clients and friends fancied it, try out the Home Dynamix Royalty Red Traditional Area Rug from Amazon. It has a basic traditional design and would go well in any home setting, whether it be traditional or modernistic.